OPEN MIND Technologies has now been awarded Tier 1 membership status at the University of Sheffield Advanced Manufacturing Research Centre (AMRC). The globally renowned research facility has invited OPEN MIND to enhance its membership status following a number of successful collaborative projects that have been undertaken during OPEN MIND's four year tenure as an AMRC Tier 2 member. The AMRC in Rotherham near Sheffield, UK, was initially founded in 2001 as collaboration between the University of Sheffield and Boeing with support from Yorkshire Forward and the European Regional Development Fund. It now has over 80 industrial partners that include Boeing, Rolls Royce, BAE Systems, Airbus and of course OPEN MIND Technologies. The centre acts as a support mechanism for the aerospace and other high-value advanced manufacturing sectors, driving technology brands such as Mitsubishi, DMG Mori, Nikken, NCMT, Renishaw, Starrag and many others to develop innovations that enable OEMs to hit their targets. Targets that will primarily be to manufacture components and assemblies faster and more efficiently without increasing the shop floor plant list. To put this philosophy into perspective, by 2032 it is estimated the global aerospace industry will demand 29,000 new large civil airliners, 24,000 business jets and 5,800 regional aircraft valued at over US$5 trillion - a potential market value of around US$600bn for the UK over the next 20 years. The industry is of such importance to the UK economy that the government has committed £10bn (US$15bn) over the next ten years to developing the industry. An element of government strategy involves supporting innovation centres such as the AMRC, and in turn, the AMRC is driving innovation within the aerospace industry to ensure it achieves these targets. Now, OPEN MIND has its seat at the twice-yearly board meetings to discuss the next series of development programs. The shop floor at the AMRC is regarded as the industry test bed for the next generation of production technology. Machine tools provided by either the machine tool manufacturer or OEM and new technology such as cutting fluids; cutting tools,workholding and toolholding technology, CAM software and machining strategies as well as new material compositions are all tested to the limit on the AMRC’s state of the art machines. To ensure smooth up-scaling from research to full production, the AMRC clones the manufacturing environment of the OEM for test purposes. 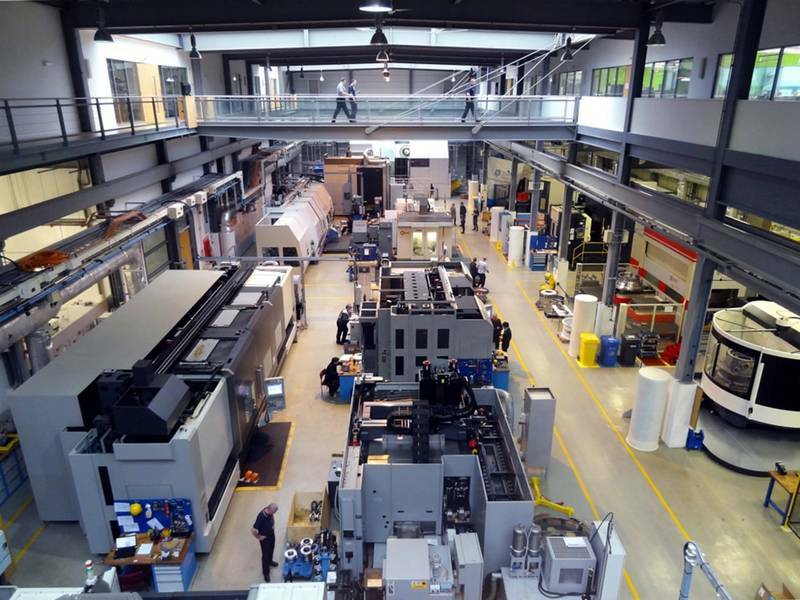 For example, the AMRC has a large bed WFL turning centre for producing under carriage components for Messier Dowty, a DMG Mori NT5400 and NT6600 as used for engine case production at Rolls Royce and a Starrag STC1250 and Ecospeed for processing BAE components, as just a few examples. for implementation in the global aerospace industry.